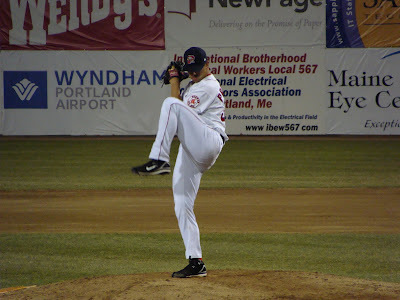 The Portland Sea Dogs finally got the the New Britain Rock Cats, and when they did, the flood gates opened. Portland used a pair of 3 run innings to beat the Rock Cats 10 - 6. Portland Starter Felix Doubront went 4 1/3 innings, giving up 2 runs on 2 hits and 7 strike outs. Doubront dispatched the Cats quickly in the 1st, setting them down 1-2-3 on 9 pitches. Doubront went relatively unscathed through 4 innings allowing only 2 hits and 2 walks with 6 strikeouts. The Sea Dog offense finally got going in the bottom of the 4th, after New Britain replaced starter Matthew Fox with the 1st of many relievers. Zach Ward replaced Fox and quickly allowed all of Fox's runners to score. The Sea Dogs were led by an Aaron Bates double and RBIs Jorge Jimenez and Reid Engel. The Rock Cats got the 2 right back when Doubront hit Tony Gardenhire ( son of Minnesota Twins manager Ron Gardenhire) and Brian Dinkelman back-to-back. Sea Dogs manager Arnie Beyeler pulled Doubront in favor of Chris Province, who surrendered a 2 RBI single to catcher Wilson Ramos. The Sea Dogs were quiet until the 7th when they broke things open. Catcher Mark Wagner opened the inning with a blast to deep left center. Wagner has had a good home stand so far throwing out all 5 attempted steals, giving most of the credit to his pitchers. "Guys are giving me a chance to throw runners out which makes life a lot easier," said Wagner. The Dogs finished off their scoring in the crazy 8th inning with New Britain committing 4 errors and issuing 4 walks that lead to 4 unearned runs on just 1 hit, a single by Bubba Bell. Reliever Chad Rhoades came in to shut out the game, allowed 2 runs in 2 innings of work, but came away with his 3rd save of the season. GAME NOTES : Sea Dogs General Manager Charlie Eshbach relayed a story about Mark Fidrych in the press box. Mark Fidrych tried a comeback with the Red Sox in 1981 and 82 and played in Pawtucket for the AAA team. "(Pawtucket Manager) Tony Torchia said that he had to release Mark, so he called him into the office. He told Fidrych he was out and added 'players get released, legends retire'. Fidrych responded, 'Guess I'm retired!'" Family Affair...the Rock Cats have 3 sons of MLB fathers..Joe Gaetti, son of Gary Gaetti. Toby Gardenhire, son of Twins manager Ron Gardenhire and Steve Tolleson, son of Wayne Tolleson. The Sea Dogs went 4 - 17 with RISP, but still had 26 AB in those situations. Lars Anderson and Ryan Khoury have reached base safely in all 5 starts.